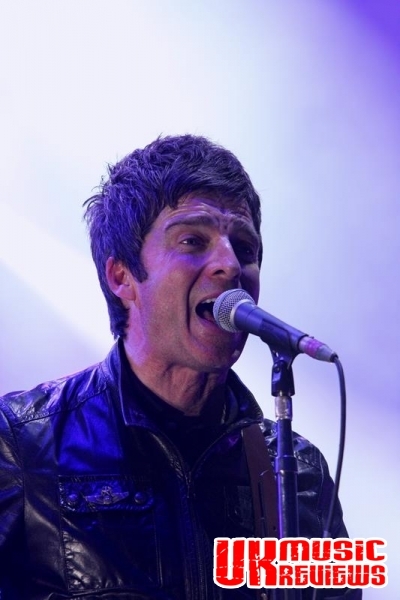 It has been five and a half years since Noel Gallaher stormed out of that Paris gig in October 2009, declaring that his days with Oasis were over for good. 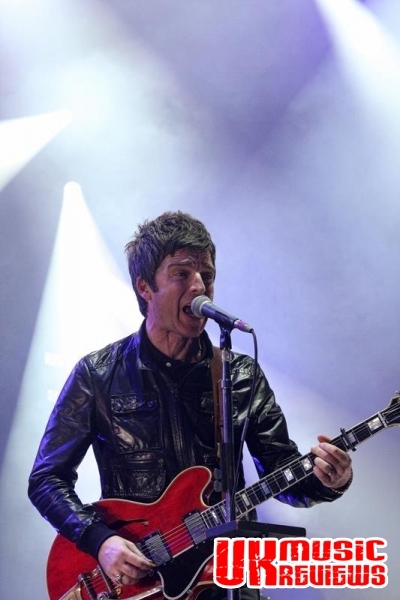 Many were sceptical, and many more didn’t think that Noel would make it in the music industry on his own without his brother, frontman and loud mouth, Liam. 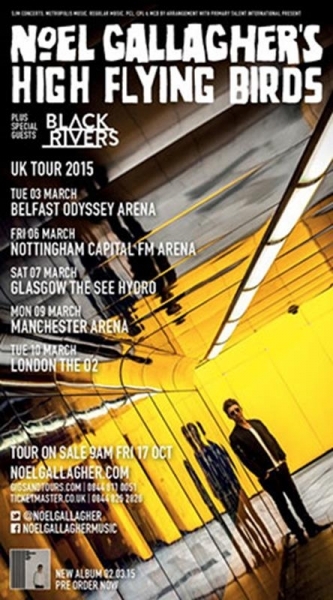 But here we are, some years later, on an Arena tour which has mainly sold out, to promote his second album, Chasing Yesterday. 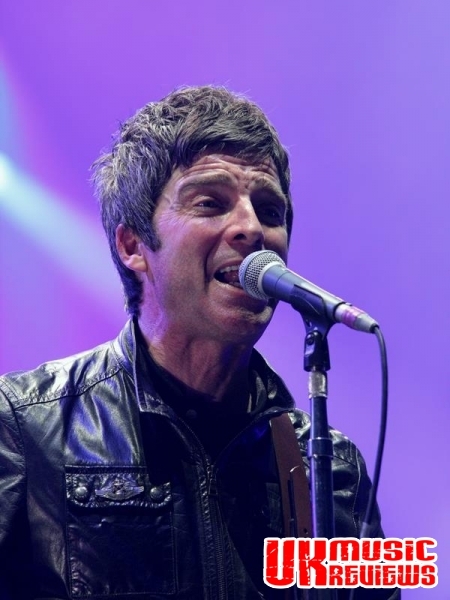 Whilst he does not command the stage presence of his brother and he is the first to tell his fans that “there is nothing to look at but plenty to listen to”, Noel Gallagher is still hailed as being rock royalty. Appearing on stage in an understated manner with his High Flying Birds, Mike Rowe, Jeremy Stacey, Russell Pritchard and Tim Smith, they opened with (Stranded On) The Wrong Beach, a track from their debut album. Accompanied by a choir, fans favourite, Everybody’s On The Run set the bar for the rest of the gig. Next up was the first Oasis track of the evening; a more acoustic version of Fade Away which was accentuated by a series of nostalgic photographs that were projected behind the group. Following up with tracks from their latest album, In The Heat Of The Moment amped things up, whilst Riverman sounded better live when delivered with a fine three piece brass section. Two more Noel solo numbers followed; The Death Of You And Me and You Know We Can’t Go Back, before Champagne Supernova brought the crowd to its feet in a mass sing a long, and allowed Noel to stay quiet during sections of it so as to take in the crowd’s own rendition, merely accompanying them on his acoustic guitar. The brass section returned for Dream On, whilst two more new tracks were very well received. 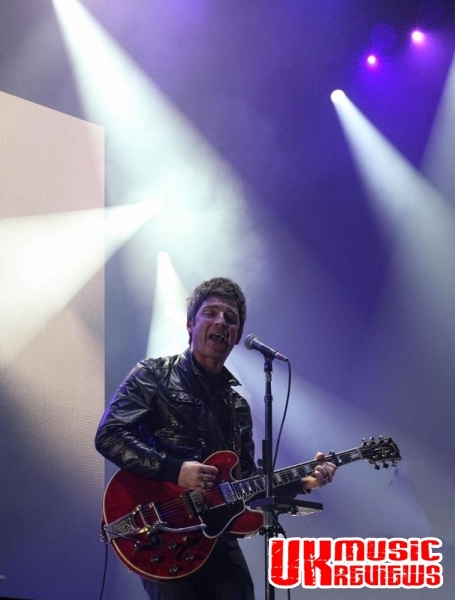 But in truth, it is the Oasis tracks that most of the crowd want to hear, and they were not disappointed with a rocking version of Shout It Out Loud, and Digsy’s Dinner before finishing with AKA…What A Life! from their previously self-titled album. With the crowd demanding more, the band took to the stage for a four track encore. AKA…Broken Arrow was followed by a stripped down version of Don’t Look Back In Anger, which for me was the highlight of the set. It has always been a song which provokes a mass sing a long and tonight was no exception. The crowd’s version could have gone on indefinatly, but the band and choir, who had returned to the stage, brought it to a close. 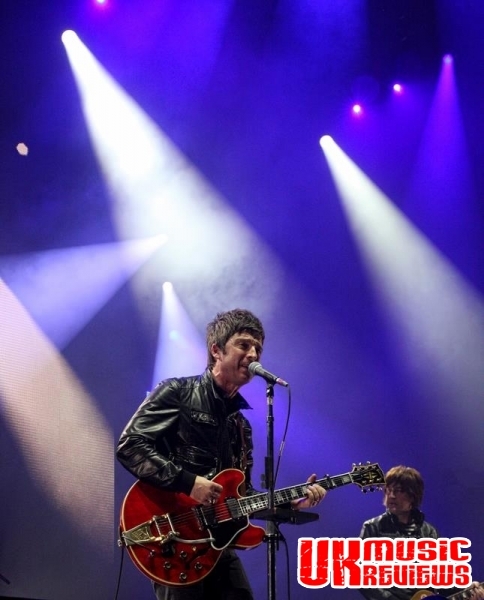 The penultimate song was one from the new album, Ballad Of The Mighty I, before they finished with the Oasis anthem, The Masterplan, backed by the brass section and choir. It was simply awesome. Was there much to look at? Well, no, not really. Was there plenty to listen to? Absolutely! 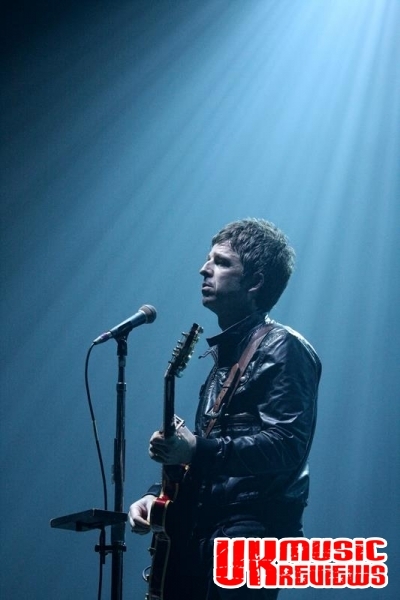 Noel clearly doesn’t have the charisma of his brother, but what he does have is an outstanding talent for writing songs, and if you listen to his lyrics you quickly realise that he is perhaps one of the greatest songwriters of our generation. 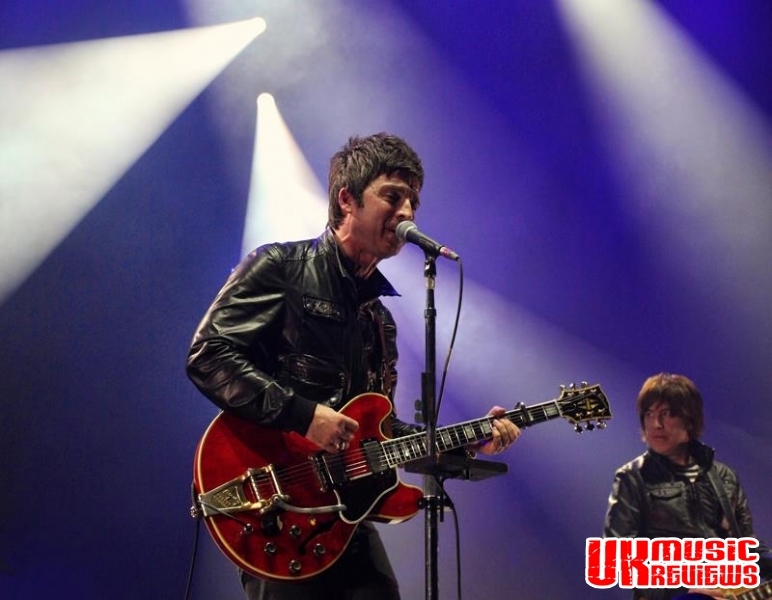 As the crowd left the Arena, still hanging on to their Paul Weller style haircuts and clutching their parkas, there was a cacophony of Champagne Supernova followed by Don’t Look Back In Anger, which proved that whilst Noels new material is very good, it is the old material that never dates and it was quite clear that if he tours again, there will be countless fans still Chasing Yesterday.